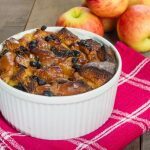 Apple Bread Pudding is best served warm with either cream, ice-cream or custard. An unfiltered apple cider or juice, which is usually available at natural food stores, adds a clear distinct apple flavor to this dessert. If unavailable, include the vanilla and cinnamon. In mixing bowl, toss together bread, apple and butter. In separate bowl, whisk together eggs and honey; whisk in cider, and vanilla and cinnamon. Let stand for 1 hour. Pour pudding into 6-cup baking dish. Bake in 325F (160C) oven until apple bread pudding is firm (about 45 minutes). Serve warm and add ice cream if desired. This pudding will keep several days in the refrigerator. 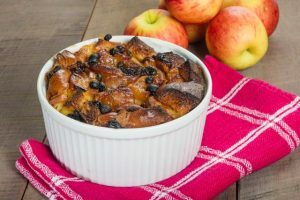 Apple Bread Pudding is best served warm with either cream, ice-cream or custard. An unfiltered apple cider or juice, which is usually available at natural food stores, adds a clear distinct apple flavor to this dessert. If unavailable, include the vanilla and cinnamon. Originally a peasant dish designed to use stale bread, it has evolved to the dessert menu of many top restaurants.